In a large skillet, over medium, heat butter until melted and sizzling. Add onions, garlic, and season with salt. After onions turn translucent, 3-4 minutes, reduce heat to medium-low and continue to cook and stir every few minutes. Onions are done when they turn dark-brown, about 45 minutes. Meanwhile, heat oven broiler to high temperature and arrange a rack on the top position. Line a sheet pan with aluminum foil and lay the steaks on it. Season the steaks with salt and pepper on both sides. Broil the steaks for 4-5 minutes a side for a medium-rare temperature. Remove the steaks and allow them to rest for 2 minutes. 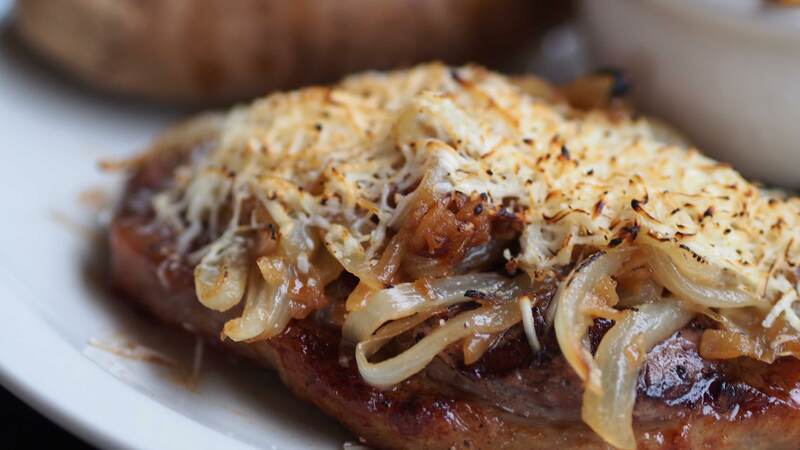 Then, spread the caramelized onions equally over the steaks. Top each steak with 1/4 of parmesan cheese. Adjust the broiler temperature to low and place the steaks back under the broiler for 1-2 minutes or until the parmesan cheese crust is golden brown. Alternatively, using a culinary torch, heat the parmesan cheese until golden brown. Serve immediately.